Are big social media companies being used to advance the New World Order's agenda? Are big social media companies being used to advance the New World Order’s agenda? In 2018, we have seen an unprecedented crackdown on anti-establishment voices on Facebook, YouTube and Twitter. When they were first created, these social media platforms were essentially neutral, and they really did greatly contribute to the marketplace of ideas. But now there is a tremendous effort to censor voices that are a threat to the establishment, and in recent months we have witnessed the greatest purge of conservative voices in the history of the Internet. Anything that does not conform to the agenda of the elite is being labeled as “hate speech”, and countless anti-establishment voices have had social media accounts either “shadow-banned” or terminated completely. Needless to say, this could dramatically affect the outcome of the elections in November. And it isn’t just political voices that are being silenced. As you will see at the end of this article, Facebook has been shutting down dozens and dozens of alternative health pages. Vice News mentioned just a few examples, but the truth is that hundreds of prominent anti-establishment conservatives have been “shadow-banned” on Twitter. Conservative members of Congress such as Mark Meadows, Jim Jordan and Devin Nunes have all been victimized, and earlier today U.S. Representative Matt Gaetz posted a furious tweet in which he accused Twitter of “deliberately targeting” all of them. If Democrats were being treated the same way, at least we could say that Twitter was being fair. When you are shadow-banned, it becomes much more difficult for people to find your account, and whatever you post is seen by a lot fewer people. Some examples of accounts which have been censored include author and journalist Mike Cernovich, author and YouTuber Stefan Molyneux, InfoWars Editor-at-Large Paul Joseph Watson, Gateway Pundit founder Jim Hoft, and commentator Laura Loomer. Breitbart News also discovered other examples of censored users, which included author and commentator Lauren Southern, OAN correspondent Jack Posobiec, Dilbert creator Scott Adams, lawyer and commentator Will Chamberlain, Gateway Pundit reporters Lucian Wintrich and Cassandra Fairbanks, Daily Caller contributor Scott Greer, Daily Caller reporter Peter J. Hasson, Daily Caller and Rebel Media journalist Rob Shimshock. But let’s not just pick on Twitter. 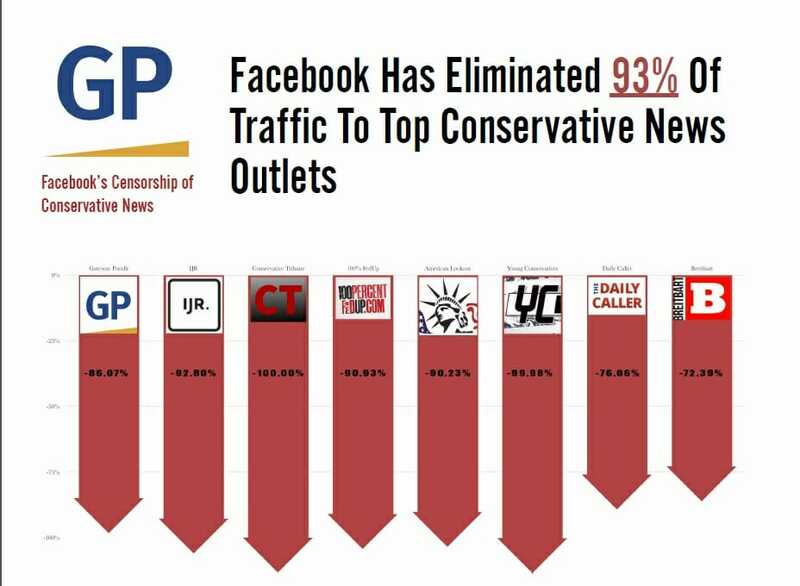 Facebook is an even bigger offender, and it has been reported that traffic from Facebook to many conservative sites is down by 70 percent or more since the 2016 election. YouTube removed four videos from Jones’ channel, which has 2.4 million subscribers, that contained instances of hate speech and child endangerment, sources familiar with the matter said. YouTube channels are deleted if they get three strikes in a three-month period. Two videos contained hate speech against Muslims, and a third contained hate speech against transgender people, sources said. A fourth showed a child who was pushed to the ground by an adult man, under the headline “How to prevent liberalism.” All four of the videos are currently posted on Infowars. My You Tube channel has been terminated. 3rd strike for no good reason. #Censorship #BigBrother Please tweet to @TeamYouTube & demand that this injustice be immediately corrected by restoring my channel. There were hundreds of high quality videos on that channel, and now they are all gone. It is important to keep in mind that it appears that it is only anti-establishment voices that are receiving this kind of treatment. In fact, I don’t know of a single “never Trump” Republican that has been censored. Establishment voices on the “left” and the “right” are being totally left alone, but anti-establishment voices are being relentlessly persecuted. We will continue to press Facebook, YouTube and Twitter for answers, but it has become exceedingly clear that they are singling out particular points of view for censorship, and the end result is that the agenda of the New World Order is being advanced. If Facebook, Twitter and YouTube have begun a major censorship campaign on social media that started out neutral, then interference in elections has occurred, is occurring and will continue to occur until this anti-democratic practice is stopped or circumvented. Rather serious offence, don’t you think? And quite offensive. This stinks! Western media is the mouthpiece of Deepstate and social media itys feeler.